Home / Recreation / Games / Look Out! Here Comes Jellybean Games! One of the reasons we go as a family to annual gaming conventions is to stay on top of new games and publishers. 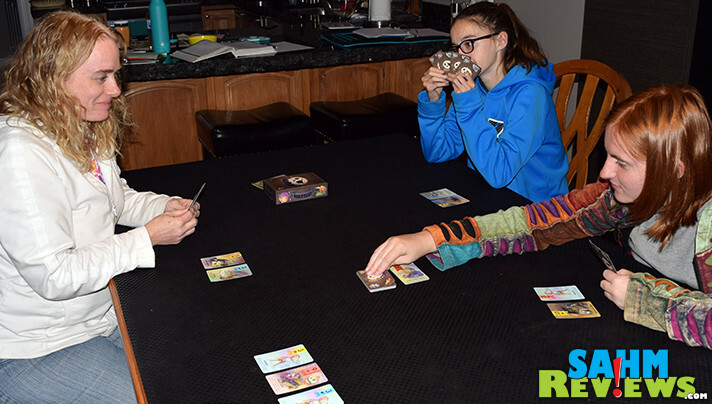 Sure, we’re there to play games too, but being “in the know” is as exciting to us as rolling dice or bluffing our way through a game of Ultimate Werewolf. Typically we’re rubbing elbows with our publisher and designer friends we’ve made over the years and sometimes they’ll give us a sneak peak of something they’re working on. In the future we’ll even be able to tell you all about a game that’s coming out soon that Scott was able to give valuable input on and his ideas were immediately implemented into the final product! 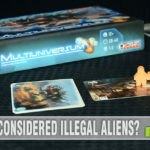 While at these conventions, we’re always on the lookout for games that serve dual purposes. Ones that are fun to play AND can teach at the same time. 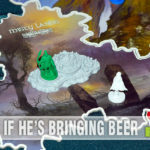 We’re always interested to see the latest creations from Genius Games as well as ThinkFun. Both of these companies specialize in titles which can be used to introduce a young child (or an old one) to more advanced concepts in various subjects. While at this year’s Origins Game Fair we stumbled across a small booth towards the back of the exhibit floor with one person tirelessly demoing games. 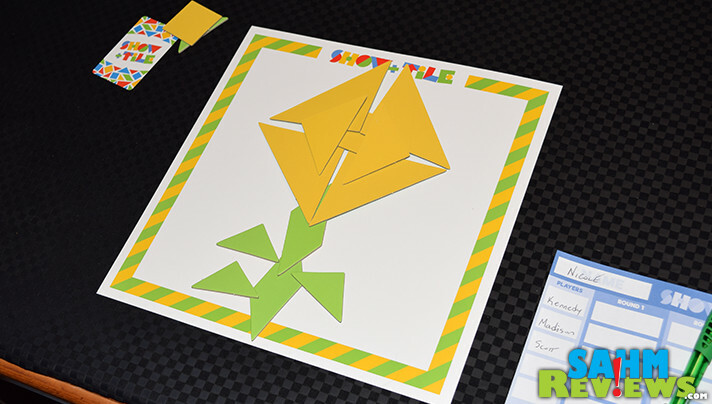 The colorful box for Show + Tile caught our eye immediately as we’ve always been fans of anything tangram related. Sadly, we were unable to get a demonstration of it or any of the other titles displayed by Jellybean Games as every time we stopped by the booth was full of onlookers. Our luck changed in August during the annual Gen Con convention in Indianapolis. Not only was Jellybean Games in attendance, they had a larger presence and at least one additional person in the booth! 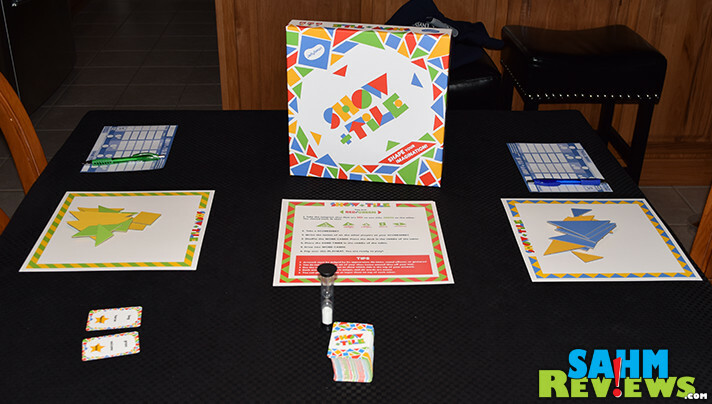 We were able to have a nice discussion with the one of the principals of the company, Ms. Nicole Perry, and found that their company motif was very similar to our core values – kid-friendly games that grownups will also love! We knew right away that our readers would want to know everything about this new game publisher and about what they have in their current lineup! Let’s start by talking about the most recent addition to their lineup. Why? 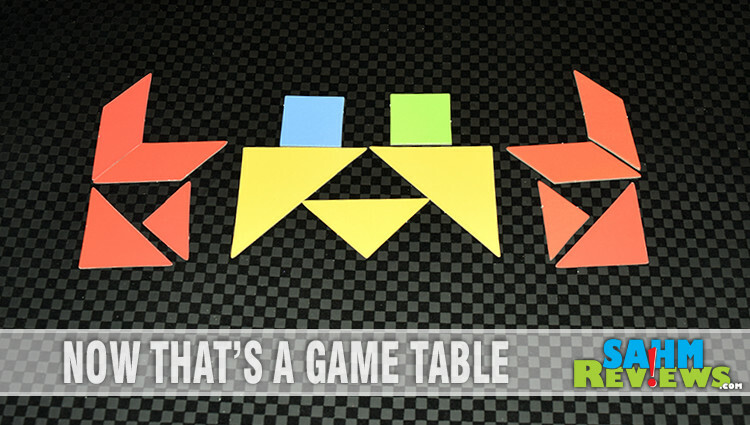 Because it’s tangrams and I just got done telling you we have an affection for these types of products. Maybe it’s because they remind us of when our girls were little. Maybe it’s because we like geometry. (Ha! We know THAT isn’t the answer.) Maybe because it offers a unique angle to a puzzle or game. That’s exactly the case with Show + Tile. In this drawing game, up to six people can compete for the most points. Yes, I classified it as a drawing game because like that’s what you’re doing. You’re drawing using shapes in the same way that you use color chips to create pictures in Pantone. 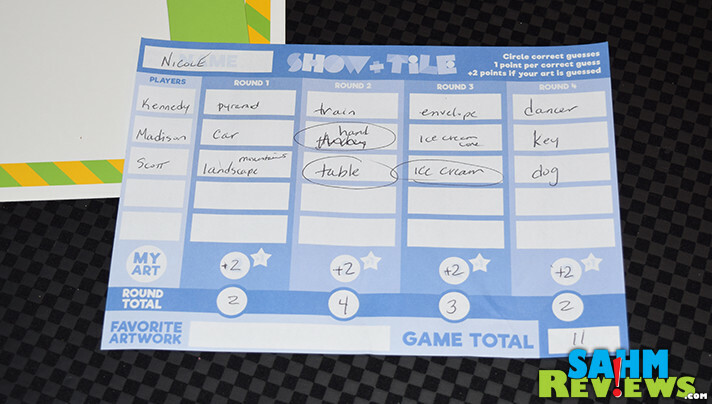 To begin the game, everyone takes a set of tiles, the corresponding work space and a score sheet. Set the timer and deck of cards in the center of the table within reach of all players. The game is easy to explain which makes it a quick process to get up and running. Everyone draws two cards and selects one that they think they can successfully craft into a picture. Flip the timer and get to work. You have 14 triangles, squares and rhombuses available to convey your design in a way that other players will be able to decipher. When the time is up, everyone turns their designs so other players can see them. You flip the timer again and have that much time to write down what you think is exhibited on your opponents’ cards. When the time is out, everyone says what they think other people drew. Score 1 point for each you guess correctly and 2 points if at least one person guesses yours correctly. 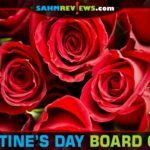 The person with the most points after four rounds is the winner. You can pick up a copy of Show + Tile on Amazon for under $25. The next two games are very similar not only in components but also in play style. I’ll explain Scuttle! first then move on to Ninjitsu! to highlight some of my favorite parts of that games. Scuttle! 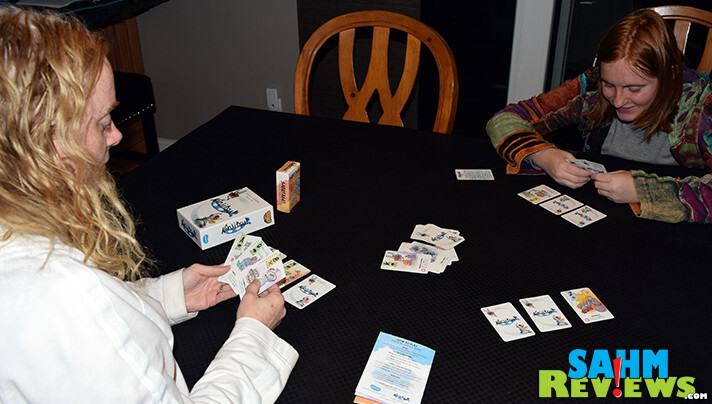 is a compact card game that plays up to 5 people, including a solo option! Each game of Scuttle! lasts about 5 minutes so you can sneak this one in when time is tight. Shuffle the cards then deal for to each player. The remainder of the deck is placed in the center of the table. On your turn, you’ll either draw a card from the top of the deck or play a card from your hand. Some cards are treasures and have a value in the upper left corner while others have abilities such as causing someone to discard or destroy cards. The goal is to be the first person (or team) to have 21 points (or 30 for a team) of treasure in front of them at the beginning of their turn. It’s a balance of luck in what you draw coupled with skill in whether you use abilities to impact your opponents. If you can picture the speed at which blackjack progresses, you have an idea of how quickly a game will take. There are a couple of variants to the game to mix things up a bit including planning a marathon to determine the overall winner or making it so you have to have exactly a certain number of doubloons. As I said before, the basis of Ninjitsu! is the same as Scuttle! however there’s more going on in this one. Also good for up to 5 players (sans the solo mode), but the extra depth of play doubles the amount of time it takes to play. This one will set you back around 10 minutes instead of the noted 5 minutes of Scuttle! 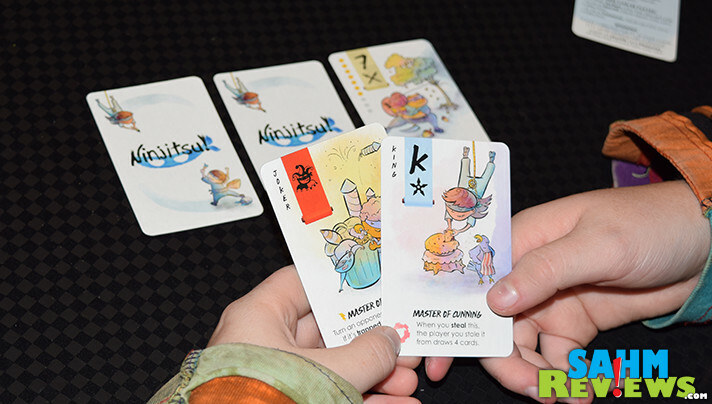 On your turn, you’ll do one of the following: (1) draw 2 cards from the deck, (2) play a card for its action or as a treasure (as you would in Scuttle) or as a secret, face-down card into your collection or (3) steal a secret card from another player. 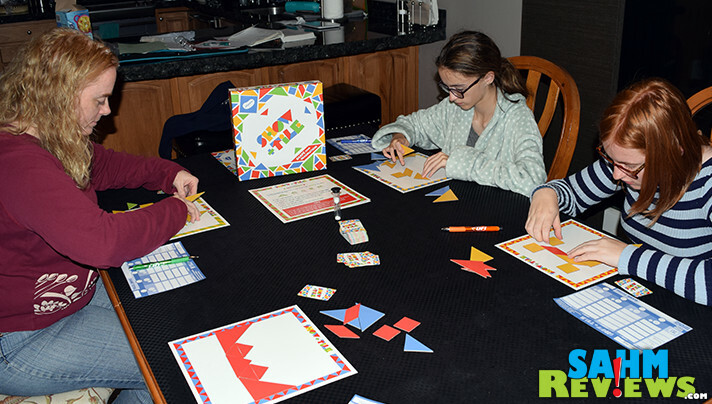 The face down cards are secret and go toward your point total, to be revealed when you reach your designated goal. Of course, there are action cards that can mess up your plans so don’t get too attached to your cards. The end game goals of Ninjitsu! 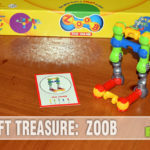 are to reach 21 or more points in a combination of face-up treasures and face down secrets. The added element of the Secret cards is what makes this one a richer experience. As a bonus, it not only comes with a Sabotage! expansion in the box, but you can also incorporate Scuttle! cards into this game as well! 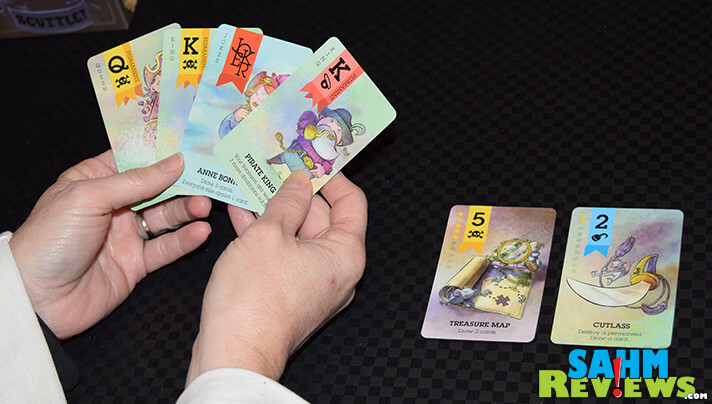 Plus, you can pick up the Treasure Hunters Expansions which works with both Scuttle! and Ninjitsu! You can add this compact game to your collection for under $15 on Amazon. We’ll be keeping our eyes on Jellybean Games not only for their ability to create family-friendly games, but also their forethought in allowing games to integrate to create a new experience. You can get a heads-up by following them on Facebook and Twitter as well. Have you ever heard of Jellybean Games? This is a great idea for a family-friendly activity for preteens. I loved playing board games with my family when I was a kid. Show & Title is my kind of game. The kiddos will be forced to play with it with me, then I’ll play a game of Ninjitsu! with them. I love collecting games like this. My kids are much older now so we have less crying, less tantrums when they lose. Haha. Anyway, I would love to check out these Jelly Bean games. It’s nice to have some game options that don’t take a lot of time. We love longer games, but can’t always squeeze them in.